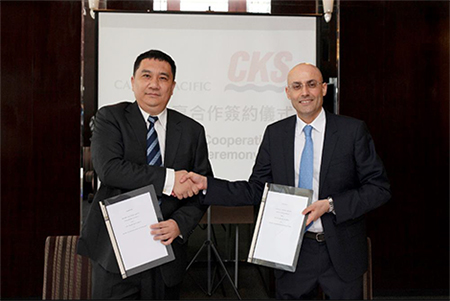 Cathay Pacific customers around the world will soon enjoy convenient access to seven key Greater Bay Area (GBA) ports in mainland China's Guangdong province, through the airline's new codeshare agreement with Chu Kong Passenger Transport Co., Ltd. (CKS). Effective from 7 November 2018, the partnership will see the airline place its "CX" code on CKS' high-speed ferry services (3A) operating between Hong Kong International Airport (HKIA) and the following GBA ports: Humen, Lianhuashan, Nansha, Shekou, Fuyong (for Shenzhen Bao'an International Airport), Zhongshan and Zhuhai. Cathay Pacific's Hong Kong hub provides unrivalled access throughout the Greater Bay Area with direct flights between Hong Kong and Guangzhou, in addition to an extensive network of road and ferry connections to Macao and Guangdong province. The new codeshare agreement enhances connectivity yet further, delivering a seamless customer journey. During the initial launch stage, Cathay Pacific customers in Australia, Canada, New Zealand, Singapore and the United States can book travel to these ports through the airline's local websites, with tickets now available for sale. Customers in mainland China can book through selected travel agencies. Booking eligibility will be extended to other international markets over the months ahead. The airline's customers travelling on these services, which depart from the SkyPier at HKIA, will enjoy check-through baggage and a choice of sailings, ensuring expedient and flexible inter-modal transport connectivity. Cathay Pacific Chief Customer and Commercial Officer Paul Loo said the codeshare agreement will boost the airline's footprint in the wider Greater Bay Area, the megalopolis that comprises nine Guangdong cities, including Guangzhou and Shenzhen, in addition to Hong Kong and Macao. He said: "We are delighted to partner with CKS and provide our customers with greater choice and more options. Extending our reach to these seven ports, providing seamless connectivity between the major financial, commercial and transportation centres of the Greater Bay Area, gives us an excellent opportunity to open up new revenue streams. At the same time, customers can take advantage of our convenient flight connections to over 200 destinations across our international network via Hong Kong." Chu Kong Passenger Transport Co. Ltd. Managing Director Tian Weiqing said the co-operation would bring a fresh experience to customers around the world. He said: "The codeshare co-operation with Cathay Pacific, Hong Kong's home airline, is a major strategic opportunity for the development of the Greater Bay Area. Chu Kong has over 30 years' experience in managing ferry services connecting Hong Kong and various ports in mainland China. This co-operation will benefit customers all over the world by creating a new network of connections within the Greater Bay Area."